I love this tool. I have a boggy yard with a lot of trees. Over the winter in different parts I can get nearly a hundred trees sprouting in some areas. This tool pulls them out in seconds. It's best, but not mandatory, to use it when the ground is soft after a good rain. I carry a flat rock around with me to hold the base of the wrench, otherwise it will sink in. It is important to have a good straight base when using this, since it can be damaged by side-to-side forces. In my area, most of the pest brush is wild honeysuckle, buckthorn, maples, and redbud. This tool pulls up stems as thick as my thumb. This is my third year of using this tool, and I don't know what I would do without it. It's especially helpful near fences. The weed wrench does what it says, but buyer beware, it is not as strong as it looks. The tool is constructed of hollow metal and the base can be bent making the tool unuseable when enough force is applied on unlevel ground. I was pulling weed trees on hard rocky ground on what I thought was a level surface, but the angle of the roots introduced a twist. Using the Medium Weed Wrench on a tree that was just big enough to fit in the jaws, I gave it everything I had. To my surprise when I was done the tree hadn't budged, but the base of my tool was bent in 2 places. I am moderately strong, but had no idea I could bend a 2" metal bar with my bare hands. I was concerned that I had a defective tool, or a bad weld which caused equipment failure. I contacted the manufacturer with photos and an explanation of what happened. I was told that I used the tool improperly, and there would be no refund or exchange. I was instructed to bend it back and it would work, but this caused the weld to break. If you buy this tool you will definately be able to rip out problem weeds that you could not with your bare hands, but don't expect good customer service if your tool gets damaged. I had seen ads for this product and was skeptical, but after reading the previous recommendation I ordered it. This is a fabulous tool. I bought the medium size, and it has very effectively pulled out each shrub, sapling and bramble that I have tried. Only one larger sapling was gave me any trouble, and eventually that came up as well. 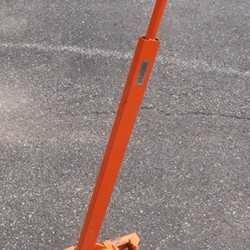 This tool does exactly what it says it will do. 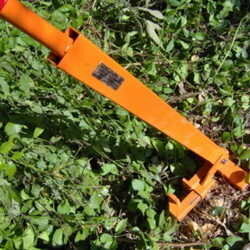 Place the jaws of the Weed Wrench around the trunk/stem/stalk, press/push down on the handle, and out pops the tree. This middle-aged woman, of below average strength, had no problems at all. The Weed Wrench I photographed is the "Light" model. It weighs just slightly over 11 lbs and can rip decent sized trees and shrubs right out of the ground. I wasn't exactly sold on this product when I first purchased it but did so out of desperation to minimize my use of herbicides. After having ripped at least several thousand woodies out of the ground using this tool- I'm sold. Incredible torque and I can rip an undesirable species right out of the ground leaving a desirable species in close proximity unscathed. From the manufacturer's site- "Weed wrench is a manually operated, all-steel tool designed to remove woody plants by uprooting. Powerful jaws with an 18:1 gripping leverage are teamed with a 6:1 leverage for pulling. Proven effective from coast to coast, Weed Wrench is an efficient, safe, selective, permanent means of eliminating unwanted shrubs and sapling trees. Soil disturbance is minimal and desirable plants are unharmed. Persons of ordinary strength can use it effectively after only seconds of familiarization. An important part of Weed Wrench's success has been that most people find it fun to use! " Incredibly, this product performs as advertised.